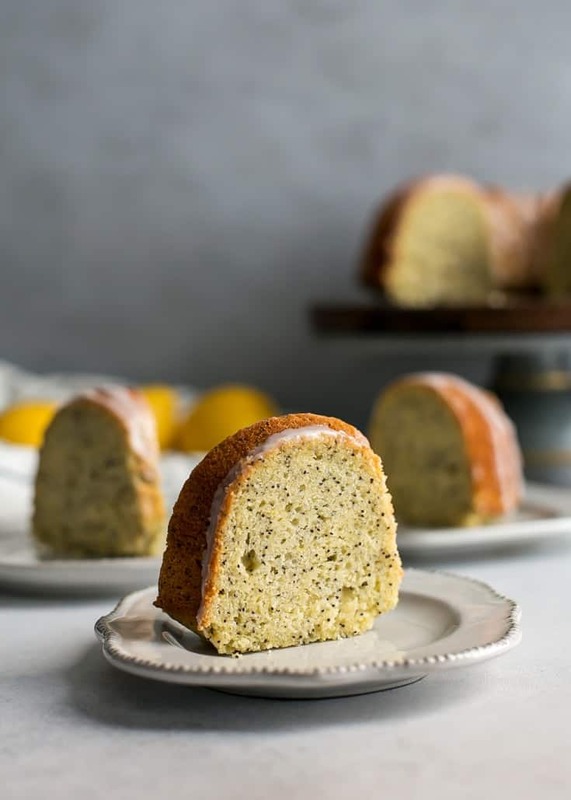 This Lemon Poppy Seed Bundt Cake is the perfect cake for gatherings. Made with a gluten-free baking flour and dairy-free friendly. 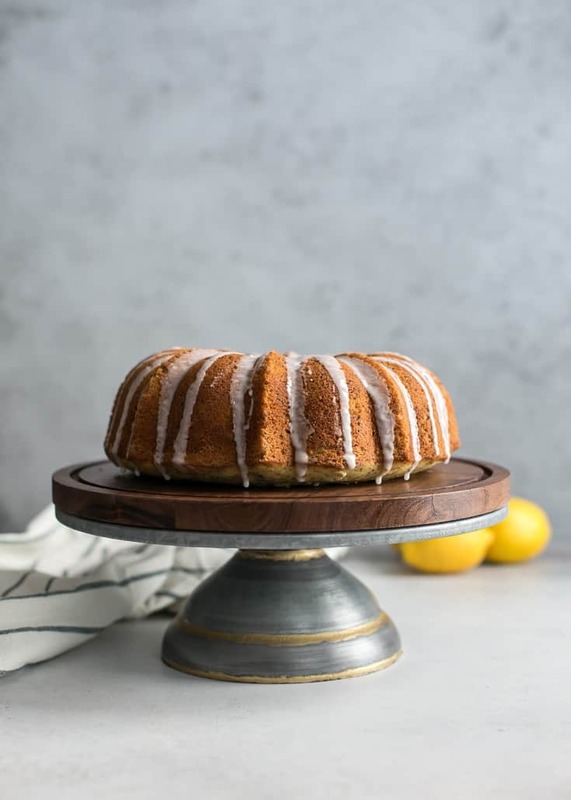 If you are a lemon lover, you’ll love this cake. 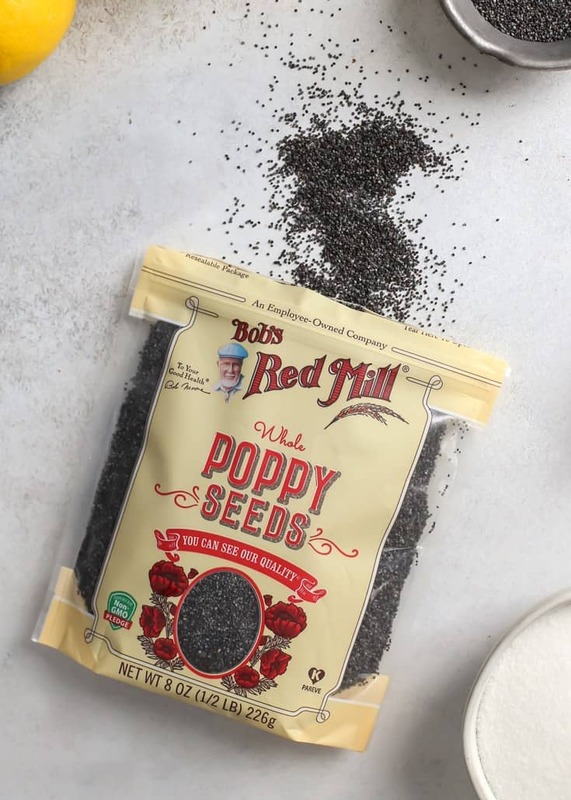 This post is sponsored by Bob’s Red Mill. As always, all opinions expressed are my own. Thank you for supporting Fit Mitten Kitchen and helping make this website possible. Well it’s official, friends… We are now puppy parents! We picked up our yellow lab last Friday and are quickly getting used to our new normal. Like waking up in the middle of the night to whimpering, having to pick up anything and everything off of the floor, and the puppy already figuring out how to knock down the gate. Ooohhh man this is gonna be fun. 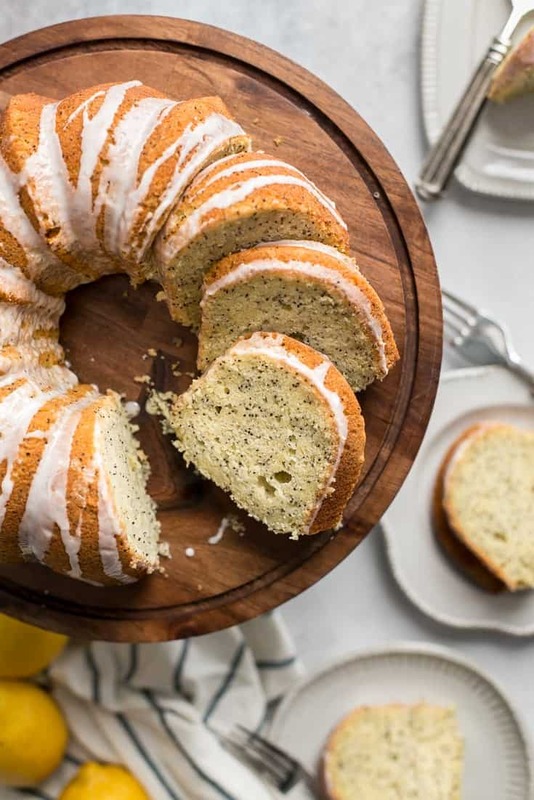 But let’s chat about this lemon poppy seed cake already! I probably say this all the time but does anyone else just LOVE lemon desserts? Like, why are they so good? And I love me some chocolate things but man lemon is a close second in some instances. Like bundt cake. 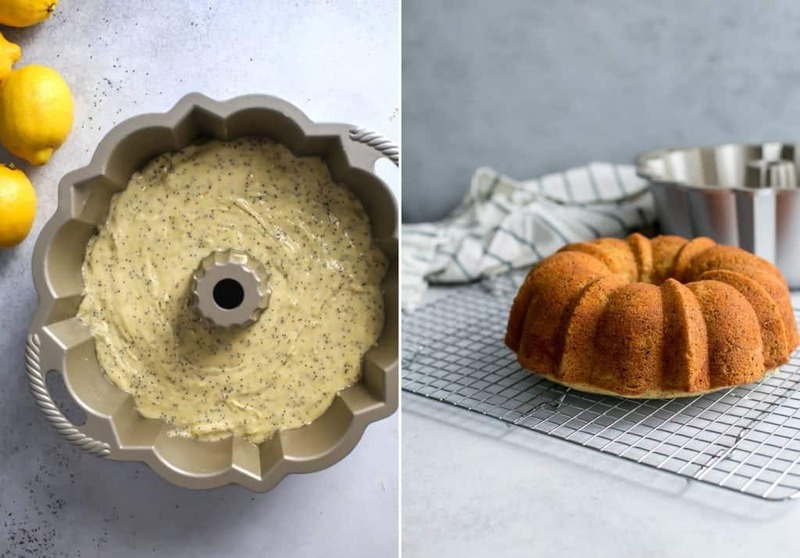 Lemon poppy seed was made for bundt pans. Ya know what I’m sayin’? 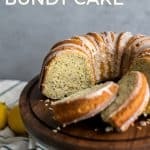 Oh and this Lemon Poppy Seed Bundt Cake happens to be gluten-free. Thanks to my friends Bob’s Red Mill. If you’re looking for a great gluten-free baking flour, this one is it! I love that the blend is already perfect and you don’t have to buy tons of different flours to get the right ratio. 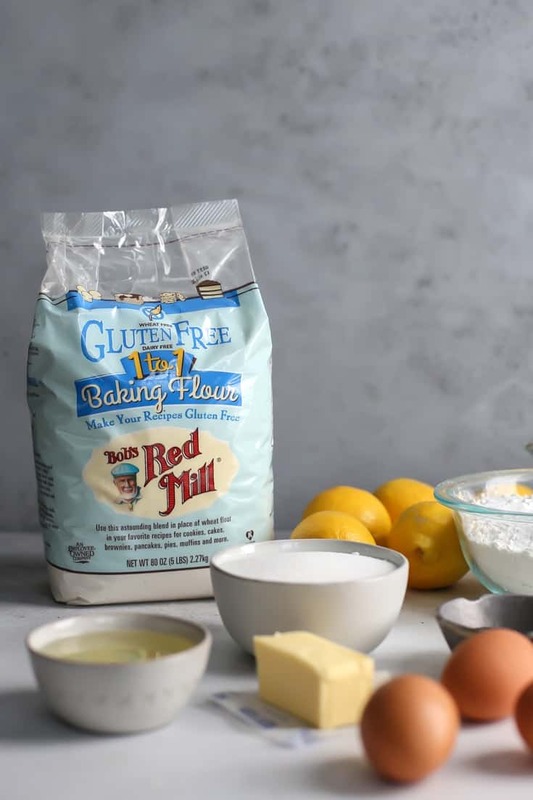 I sub this flour in loads of my whole wheat muffin and scone recipes when I am baking gluten-free. It usually works out perfectly. Typically I don’t need to make any other substitutions for those recipes either. Cookies can be a little different though so just keep that in mind if looking to sub this gluten-free flour for regular wheat based flours. 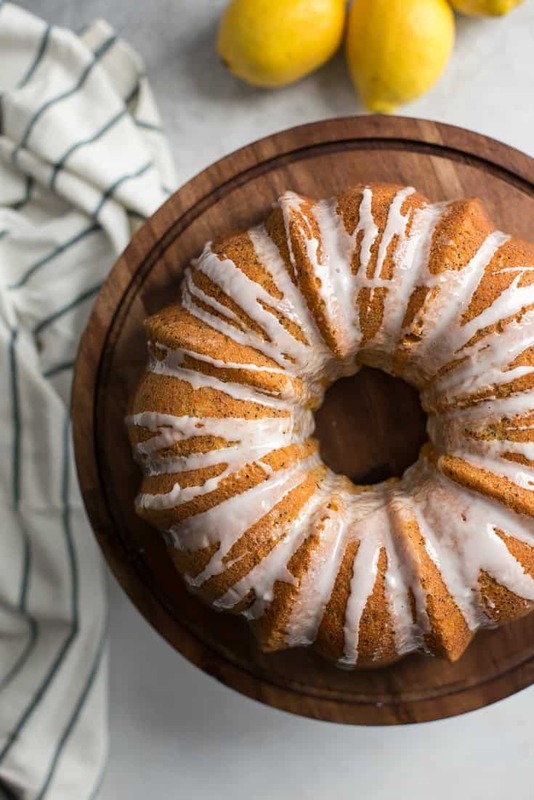 Baking this lemon poppy seed bundt cake is really not all that difficult either. I love bundt cakes because they automatically turn out pretty. And all you need for the topping is a simple glaze. 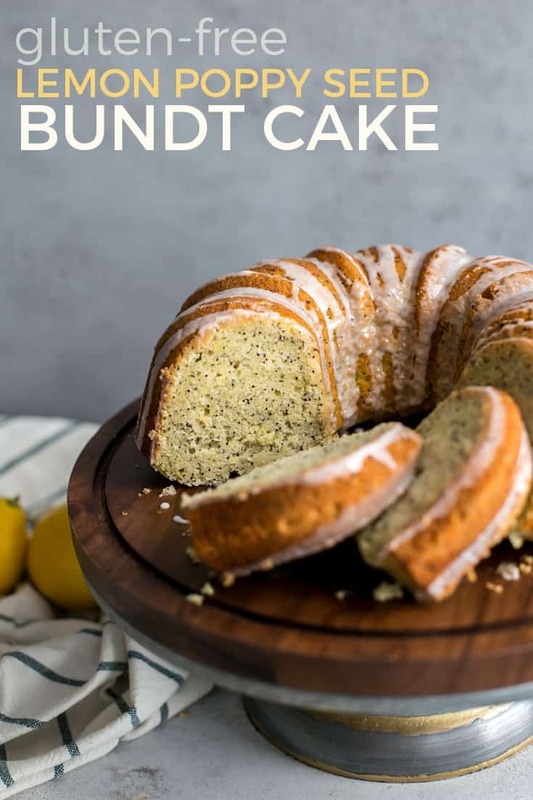 Butter – I was referencing several different lemon poppy seed cakes and most called for a full cup of butter. I decided to take the butter down a notch but still wanted a bit for some flavor. So there is just 1/4 cup butter in here but if dairy-free, you can use all oil. non-dairy milk + lemon juice (or apple cider vinegar) – This combo acts as a “homemade buttermilk”, if you will, but just dairy-free. 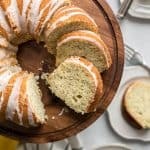 Buttermilk is a common ingredient in many conventional lemon poppy seed bundt cakes, but I’ve had success with making a non-dairy version for most of my recipes when I am thinking about the dairy-free folk. Lemons – Don’t skimp on the lemon zest here! I used about 1/4 cup of lemon zest, and then 1/2 cup of lemon juice. I thought the flavor was really good on it’s own. But if you’re really wanting to take it up a notch, you can also add a touch of lemon extract (or essential oil). MAKE AHEAD TIP: Try making this cake the day before and store tightly covered in the fridge. Then all that’s left to do the day of serving is making the glaze. All in all a pretty standard recipe. It doesn’t take too long to bake and once the cake is cooled you can drizzle on the glaze. Do make sure the cake is entirely cool though or your glaze will melt into the cake. Preheat oven to 350ºF; Spray 10″ bundt pan with oil or grease with softened coconut oil (or butter). Set aside. In glass measuring cup add the non-dairy milk plus 2 TBS lemon juice or apple cider vinegar; set aside. In large bowl using handheld mixer or paddle attachment, beat butter until light and fluffy. Then add oil and sugar beating again until thoroughly mixed – about 1 minute. Scrap down sides of bowl as needed. Add in eggs one at a time, mixing on low-medium speed until well combined. Then add in extracts, lemon zest and lemon juice, mixing on low speed. Scrap down the sides of the bowl. With mixer on low speed, slowly start to add dry ingredients about 1/2 cup at a time, alternating with milk mixture and finishing with the flour. Batter will be wet and somewhat thick. Transfer batter to greased bundt pan; bake for 35-45 minutes or until inserted toothpick comes out clean. Check the cake after 40 minutes to check for browning on the top – cover in foil if needed to prevent browning too much. Allow cake to cool in pan for 15 minutes before gently flipping cake out onto cooling rack; allow cake to cool at room temperature for 45 minutes. Once the cake has cooled make the glaze: in a medium bowl combine powdered sugar with lemon juice. Place plate under cake on cooling rack before glazing. Pour glaze over cake in zigzag fashion. Allow glaze to set for before slicing and serving. Enjoy! *If dairy-free you can sub the butter with 1/4 cup more oil or even 1/4 cup non-dairy yogurt could also work. I did not test this with another flour but I am guessing you’d be fine to sub whole wheat pastry flour here 1:1. There are no dry ingredients in the recipe. Please republish, this sounds delicious! So sorry about that! I am in the middle of switching recipe cards and must have not pulled those over properly. Updated now! Would this work to make donuts? Hi Jamie, it probably would! I’m not sure how many donuts it would yield. But if you use this donut recipe, you should also be able to use the 1 to 1 GF flour as well. Would love to hear if you try! Thank you Ashley for pointing me to your donut recipe. I will be trying that one (GF) for an Easter breakfast treat. I am not sure you’ll get as soft or moist of a cake by taking out all of the oil – I think it would be best to keep a few tablespoons in if possible, and using a yogurt (even a dairy-free would be fine if needed) might give you better results. But again not 100% certain without trying it myself. Let me know if you do! I made this recipes last night and had such high hopes! Sadly it came out extremely dense. The only change I made was using 1/4 cup of earth balance butter rather than regular butter. Any ideas why? Would love to try it again! Hi Sarah, So sorry the recipe didn’t turn out as you had hoped. I don’t believe the Earth Balance would affect the recipe that much. Did you possibly over-mix the eggs/batter. Did you use a whole wheat flour or a gluten-free all-purpose? Will this work with regular milk? Sounds so good! Do you know how you would substitute maple syrup for the sugar? I can’t confidently say since there is more that a cup of granulated sugar to sub. You could try 1 cup of maple syrup and you may only need 1/2 cup of milk, but again I haven’t tested this recipe using maple syrup or honey so I really don’t know.